The black TravelCoat Lens Cover for Nikon 200mm VR Lens from LensCoat is a 3.0mm thick shock-absorbing closed-cell neoprene lens cover. It is designed to fully protect the lens when not in use, without the need for a more comprehensive lens case. It allows more valuable room for packing and storage. The coat simply slides over the lens, and closes with a secure touch fastener. This version comes in a matte all-black finish to better blend in where desirable. Or, it can be used just for its protection value. Box Dimensions (LxWxH) 10.6 x 5.8 x 0.8"
TravelCoat Lens Cover for Nikon 200mm VR Lens (Black) is rated 3.0 out of 5 by 3. Rated 3 out of 5 by wasabiwinny from Solid - But not the only option. I use this to protect the uber-large 200 / 2.0 but other options work too. I'm into taking this equipment into the wild and the best solution I've found are the Domke wraps. They are more versatile because you can wrap them around equipment or use them as padding in a backpack. 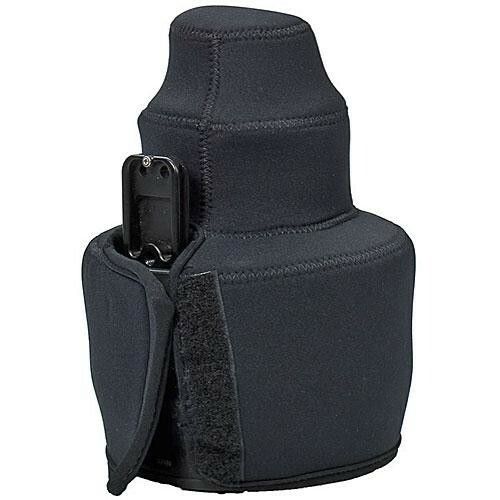 There's nothing wrong with this product, just that it's more for travel protection than in the field use. Rated 1 out of 5 by Juan Pablo from WRONG PICTURE! I buy this product because i saw the picture and is a CAMO... i recive the AP SNOW... The picture is WRONG!